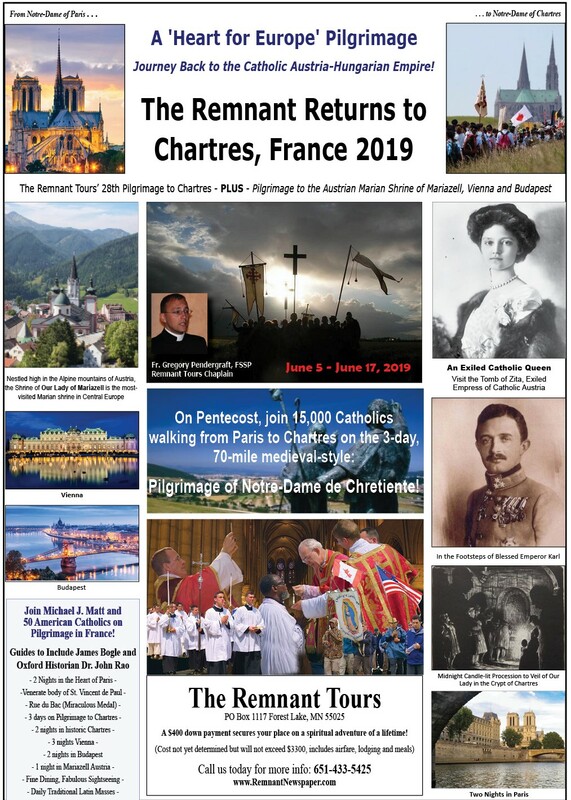 I'm very pleased to announce that The Remnant—which has partnered with Notre Dame de Chretiente in organizing the U.S. chapter on the Pilgrimage to Chartres for the past 28 years—will be returning to France in June for its 29th Chartres Pilgrimage, with an additional post-Chartres 'pilgrimage on wheels' to the heart of the old Holy Roman Empire--Vienna and Budapest. Dr. John Rao and I--along with Father Gregory Pendergraft, Christopher Ferrara and "Heart for Europe" author James Bogle--would like to invite you to be with us for this magnificent event, which is centered on the 3-day, 2-night walking pilgrimage along the old medieval route from Paris to Chartres. This is, in fact, the traditional French starting point of the Camino, or way of St. James, from the Saint-Jacques Tower in the 4th arrondissement in Paris to the tomb of St. James the Apostle in Santiago de Compostela in Spain--the greatest walking pilgrimage in the world. Notre-Dame de Chretiente (NDC)—the organization responsible for what the late, great Michael Davies described as the ‘most important annual event in Christendom’—the Chartres Pilgrimage from Paris to Chartres, France—has informed us that a very tradition-minded bishop will celebrate the Pontifical High Mass in the Cathedral of Notre Dame de Chartres at the next pilgrimage to Chartres, June 10, 2019. We will announce his name, but all in good time. Those wishing to register online, can do so by making a $400 “donation” here, earmarking it for “Registration for the 2018 Remnant Tours’ Pilgrimage to France and Portugal”. Young men interested in a joining my son Walter Matt's "U.S. Rangers"--the American tent-building contingent-- should also contact our office. There is a $1000 reduction for those who qualify to build the pilgrim tents rather than walk the pilgrimage. For nearly thirty years, it has been my honor to serve as U.S. Coordinator for our French brothers at Notre-Dame de Chretiente. So anyone who has any questions about this pilgrimage-- its logistics, how to prepare for it, how to join a specific chapter, how to become a "Chartres pilgrim", etc.-- should contact us via email or telephone anytime over the next couple of months. I hope to see you on the road to Chartres. 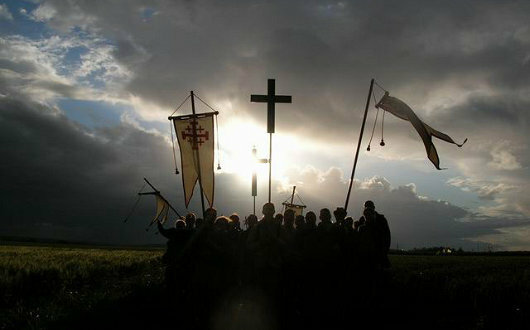 Chartres sonne, Chartres t'appelle, gloire honneur au Christ-Roi!